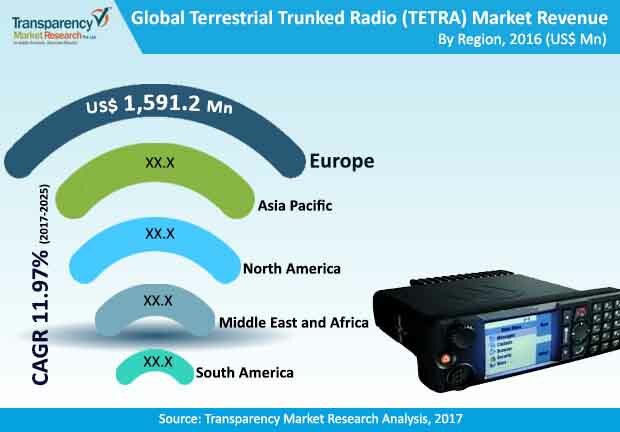 The global terrestrial trunked radio (TETRA) market is set for sound growth in the forthcoming years. This is primarily to provide foolproof communication systems for homeland security of nations. Apart from this, communication needs of various public safety agencies such as police, fire department, utility companies, and other services that need to transmit critical information in a timely manner is also leading to the deployment of TETRA systems. Due to its capability, TETRA has been deployed at some global public spectacles. For instance, in 2015, the state secretary of Rio de Janeiro engaged a company called Teltronic for secure mobile radio communication for Rio Olympics 2016. A report by Transparency Market Research (TMR) projects the global TETRA market to clock a healthy 11.97% CAGR during the forecast period from 2017 to 2025. Progressing at this rate, the market will reach a valuation of US$12,166.7 mn by the end of 2025. The report studies the global TETRA market on the basis of application, component, device type, and region. On the basis of component, the TETRA market has been bifurcated into hardware, software, and services. Of them, the services segment is likely to clock a notable 12.11% CAGR for the global TETRA market during the forecast period. TETRA services helps to maximize uptime and efficiency of radio communication systems. The various types of TETRA services include support, training, security, network management, optimization, integration, and maintenance services. The array of services also ensure high performance of TETRA in a cost effective manner. However, hardware segment is anticipated to account for the leading market share of 43.9% by 2025. In absolute numbers, the hardware segment is anticipated to be worth US$5,340.4 mn by the end of 2025. The hardware segment is displaying growth mainly because of increasing adoption of TETRA radios and base stations across the world. In terms of device type, the TETRA market is categorized into portable and vehicular TETRA devices. Of the two, portable TETRA device is likely to account for the leading market share over the forecast period. Portable TETRA devices provide advantage due to their compact size. This allows safety agencies to perform functions on the go. Portable TETRA devices are also useful in the event of emergency situations or to obtain directions for remotely located destinations, as it is loaded with GPS and Bluetooth technology. In absolute value, portable TETRA devices segment is likely to be valued at US$8,022.8 mn by the end of 2025. Depending on application, the TETRA market is segmented into transportation and logistics, aviation, oil & gas, public safety, and others. The other segment comprise military and defense, manufacturing, mining, retail, commercial, utilities, and healthcare. Amongst them, the public safety segment is estimated to account for the leading revenue contribution to the global market over the forecast period. The leading growth of this segment is mainly because of widespread adoption of TETRA systems by public safety agencies such as police patrol and law enforcement forces. Public safety is the focus of most players in the market to gain competitive advantage. The TETRA market has been divided into key regions of North America, Europe, Asia Pacific, the Middle East and Africa, and South America. Europe holds prominence among other key regions as TETRA was first adopted in Europe. Europe also holds significance in terms of installation of TETRA base stations and the number of TETRA users. Asia Pacific has emerged as a lucrative market for TETRA in the recent past. This is mainly because of adoption of TETRA by transport and public safety agencies in China, India, and Japan. Leading players in the global TETRA market include Motorola Solutions, ROHILL Engineering B.V., Damm Cellular Systems A/S, Airbus Defense and Space Oy, Rolta India Limited, Simoco Wireless Solutions, Cobham plc, JVCKENWOOD Corporation, Hytera Communications, and Leonardo among others. The study provides a holistic perspective on global TETRA market growth in terms of revenue estimates (in US$ Mn) globally. The market estimates have been analyzed by taking into account the impact of various economic, political, technological, social, and legal and the existing market dynamics influencing market growth. The report would also include executive summary, providing the overview of the global TETRA market. The report also provides industry development and key market indicators for the global TETRA market. Furthermore, report provides market attractiveness analysis, for each segment based on their CAGR and market share. The report also provide porter’s five forces analysis about the industry competition, market dynamics and the most profitable segments in the market. This research study on the global TETRA market provides a detailed cross segment and cross country analysis based on the different segments including application, components, and device type. Based on application, the market is segmented into transportation & logistics, aviation, oil & gas, public safety, and others. The others include military & defense, mining, manufacturing, retail, commercial, utilities, and healthcare. Based on the components, the market is divided into hardware, software, and services. Furthermore, on the basis of device type, the market is bifurcated into portable and vehicular. The report also covers profiles of major players, their growth strategies and focuses on the recent developments under the competition matrix section and includes market positioning analysis of key players operating in the TETRA market. The competition matrix for key players in the global TETRA market notes their capabilities and growth potential and also benchmarks the key companies in the global TETRA market on the basis of top line growth, market share, segment growth, infrastructure capabilities, market position, product offerings, R&D focus and future outlook. Under the company profiles section, the report also includes an overview of the players operating in the market, the annual revenue generated by them in the past two or three years, SWOT analysis, regional breakdown and their relevant business segment revenue. The report also contains market share analysis of the key players in the TETRA market for the year 2016 based on their revenues generated for the same year.